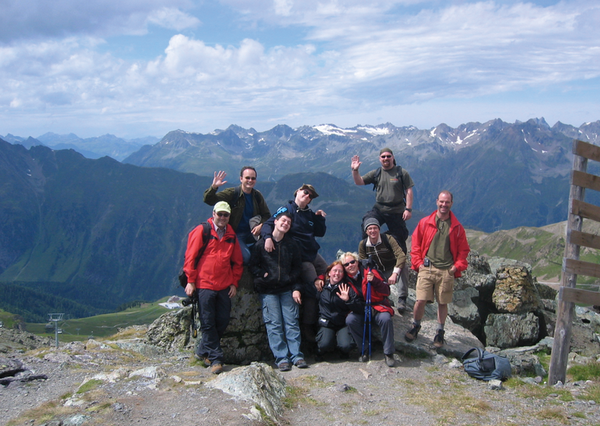 From August 9 to 17, 2008, the 10th annual Linux Beer Hike (aka Linux Bier Wanderung ) took place in Samnaun Compatsch, Switzerland . Around 50 Linux enthusiasts, families, and friends from more than a dozen different countries came together to hack, explore the Alps, and enjoy the local cuisine. Samnaun is located in the canton of Graubünden, close to the Austrian border. Famous for its large skiing area (connected with Ischgl in Austria), the valley offers fantastic possibilities for all sorts of walks, hikes, and excursions during summer. Therefore, it was not really surprising that this year the LBW had fewer indoor activities than in previous years, even though it was the first at which snow made an appearance during the week. Most attendees spent their days outside exploring the countryside and enjoying the good weather (Figure 1). Figure 1: Hiking in Samnaun, Switzerland, was a lot of fun! 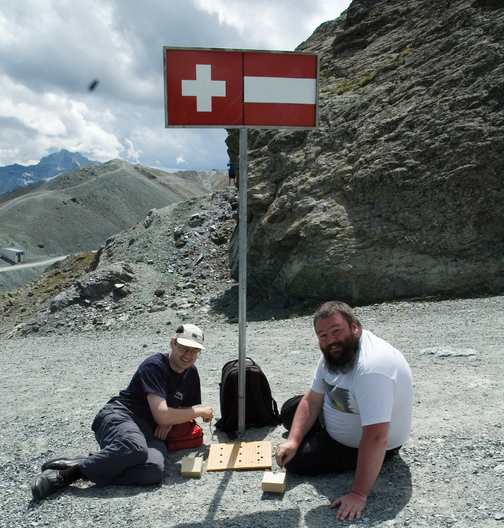 While some members of the British Go Association moved their Go board to the Swiss-Austrian border (around 2,800m or 9,200 feet) to play an international tournament (Figure 2), others walked the "scenic" route from the top of the mountain back to the hall (which was itself still 1,846m or 6,056 feet high). The adventure included crossing the border to Austria, making snow penguins, some (involuntary) tobogganing, a field full of boulders to climb over, more snow, and almost no complaining or cursing. One of the geeks started joking: "Europeans are silly – when Americans see a mountain they drive around it, Europeans walk over it." It turned out he was not completely correct, as one of the German participants took his Land Rover Defender up the mountain to rescue those whose feet had given up on the way back to the hall. Rumors were that they simply pretended to be tired so they could beat the rest of the group down the mountain and get to the beer first. Other excursions included a trip through the valley, climbing up to the Curschiglias mountain, and a visit to the local cheese-making facility (Sennerei). After the geeks had learned everything about cheese making, they had plenty of time to try the local speciality, the Samnauner Bergkäse (Samnaun mountain cheese), and everyone had the opportunity to purchase products from the nearby cheese emporium. As previously mentioned, not that many geeky things happened this year, although some people used their GPS units on the hikes and walks to collect data for the OpenStreetMap project . LBW is a week-long event that takes place in a different European country each summer, drawing together open source and free software enthusiasts and friends from more than a dozen different countries. It is an entirely volunteer-run event funded from a combination of donations among the attendees toward the cost of the hall, Internet access, etc. The LBW 2008 was another huge success – less L, some B, and plenty of W. I would like to thank the organizers for all their work. Many thanks also to the Gemeinde Samnaun and Samnaun Tourismus for giving us free access to the hall and Internet.